It seems no matter where one goes they are subjected to some sort of bug. I got out of the house for a while and attended the club jet meet. The attendance was down but the activity was not diminished. The fliers stayed quite active all day Though the sky was overcast most of the time and a few raindrops fell. The U.S Air Force Paid for my one year stay in South East Asia and hospital time in the Philippines with hepatitis. Overall I enjoyed it. The rainy and stormy season has come and gone. The pastures are drying nicely. Today was a great day to mow. So I mowed around the house then went on and mowed the runway. It is looking very inviting. 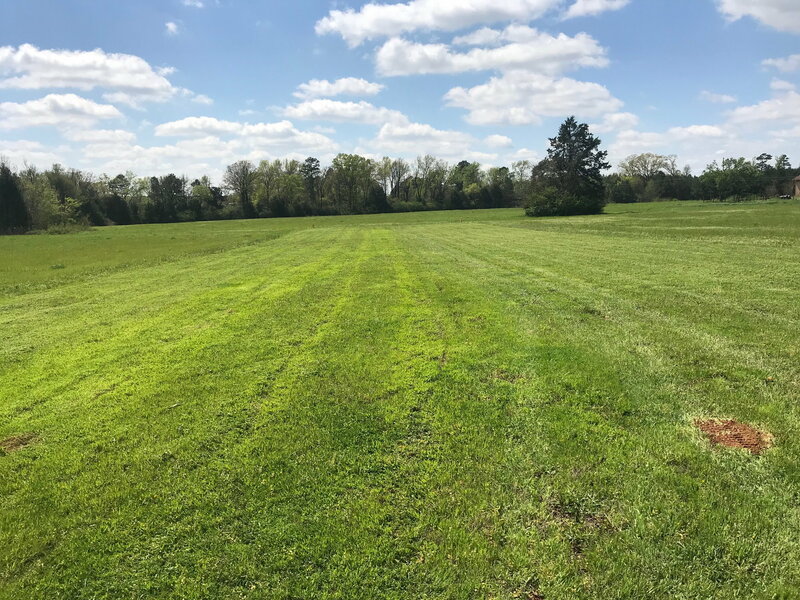 I have to make a road trip and when I return, one more mowing then the first flight of the season. I have 5 airplanes to maiden so that is how I’ll spend my time this year. No building except for maybe a small foamy electric model. "Foam" is a 4 letter word! I took my GP Easy Sport ARF out To my local RC club last Sunday afternoon and Damn if I left all the tools I needed to put it together to fly! Well I got it put together thanks to my club members. So my friend goes to start the engine and damn the engine throws the spinner right off in front of me and my friend Matt. If he had been standing in front of the engine it would have hit him! So I get the prop reinstalled and finally got in the air and made two laps around and all of sudden the engine dies in midair. I flew it back in and land it and went out and got it then restarted it and Matt adjusted the needle thinking that the HS needle was too lean.Well it barely got of the ground this time and died again and this time my landing was rough and I bent the nose gear and broke the prop. Yesterday after a talking with my friends about my engine, I decided that maybe my engine ,which I had bought on line last year which is an OS Max 46AX wasn't clearly broke in even though I was told that it had been broken in. So I put it back on my test stand and ran 4 tanks and tried breaking it in and it ran great on the stand. Today I am reinstalling it back into the airplane and I removed the front hatch and I see what looks like a minor fuel spill on the foam under my tank and then start moving the tank and thats when I saw a small tear in the pressure line that goes to the muffler. Now I am replumbing the fuel tank and replacing both fuel lines in the tank. I hope this fixes my problem as this is a really good flying airplane! Know I have 4 brand new glow engines to break in! Do you wear a dress and a crown while doing it? It's not a crown its a Tiara! Check the label of one of those you have in the closet the wife doesn't know about. Sorry, no dresses here, just string bikinis and a few thongs. Four letter word? Well, sometimes you just have to use them. Lol. mkjohnson. I’m close to Carthage Texas. About 100 miles SE of Mount Pleasant. Two hour drive or 40 minute flight. I’ve been wanting to go to MP airport. They have a nice aviation museum there that I’ve heard a lot of good things about it. If I fly, it may be my last aviation flying adventure. Well, I’ve made another road trip to Kissimmee, Fl. Oh! How many trip I have made to Central and South Florida. Too many to recall. Mostly I flew my private airplane. Five hours flight time vs 16h 48m this trip. More time to South Florida. Guess which way I prefer to go? But, good things come to an end. Time to give up flying and sell the airplane. Long driving trips ahead. I’m being pressured to make the move to Florida permanent. I just don’t want to leave my easy life in Texas. I guess I will see how that turns out. I tell them I’m just thinking about it. red head, thanks for the advice. I have been using a drag from time to time. I have a wild hog problem that shows up from time to time. They do lots of pasture damage. They finally hit my runway last go around. Pictures show show a couple of drags I’ve used. 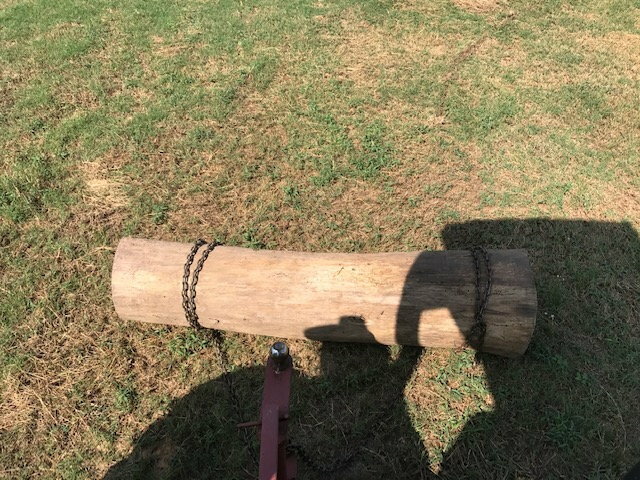 I also have a steel drag but too big and a pain to use. That is for large areas. 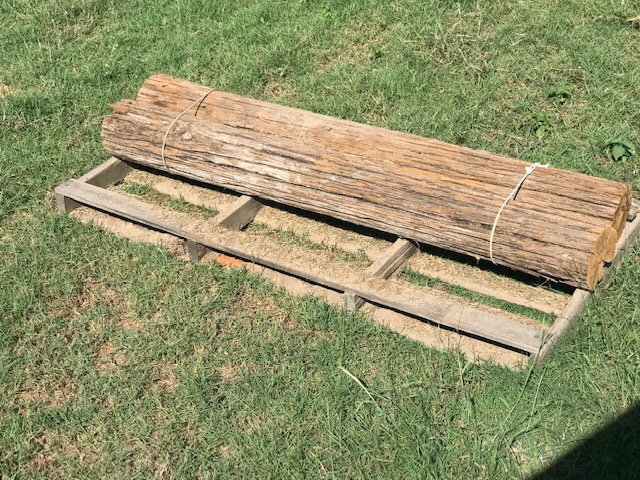 I’m thinking of maybe cutting it in half. But just thinking about it right now. Did I hear Bikinis and Thongs? I think I’m deep in the heart of that country. Hi ET, I used to drive up to Long view from Kingwood TX when my Aunt and Uncle lived in Judson just north of Long View. They moved over to Mt Pleasant about 10 years ago and they both passed around in 2010 and I haven't been there since then. I also moved from Houston over to Wichita Falls TX which is 100 north west of Fort WorthTX. Its a totally different area than your area as its not as wet but the wind blows a lot more here! It was warm enough for shorts in central France yesterday. Mind you the guy in the picture used to be in the French Foreign Legion! I do a lot of shopping in Longview, TX. It is the closest large city with shopping for just about everything. Shreveport, LA is the largest city in the area. Get just about anything there. I go to Barksdale AFB, across the river from Shreveport, periodically. Traveling to the nearby cities is just the way of life when you live in the country. Here in Central Florida it may take 30-45 minutes to go a few miles. Too much traffic and congestion. The country drive is at highway speeds but just have to travel farther. I like the country drive. Closest I’ve been to Wichita Falls, TX is a few flights into Denton and Sherman, TX and Oklahoma City. Yep, a bit windy in that area. I'm going to try to visit the local flying club here. Last time I went it was a weekday and no one there. Probably call them for info on best time to go. Probably over next weekend. Also going to visit Graves RC Hobbies while I’m here. Best hobby shop I’ve visited since returning to the hobby. I've made a start on the Big Guff! Three months behind schedule but I've been distracted! The pictures were taken just before I stopped for tea, hence the diagonals haven't been finished off. PS. Ive decided to go with the door! Last edited by Telemaster Sales UK; 04-02-2019 at 07:43 AM. Nice going, Telemaster. 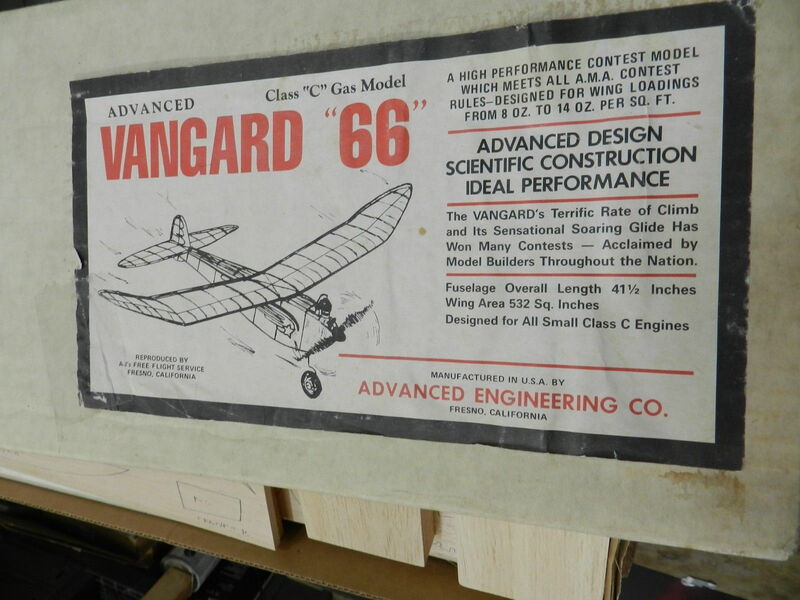 Your kit and build reminds me, this year I picked up an NOS Advanced Engineering Vanguard 66 old timer kitted by A.J. 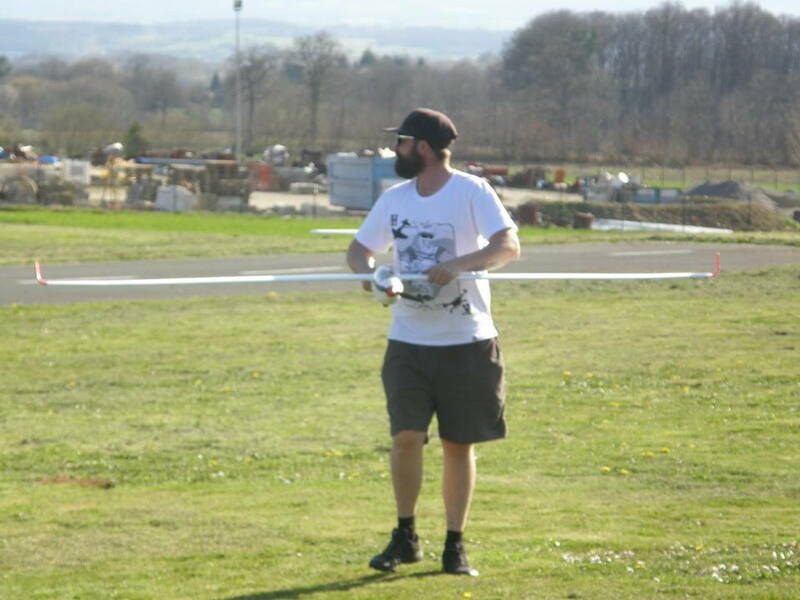 Freeflight Service. 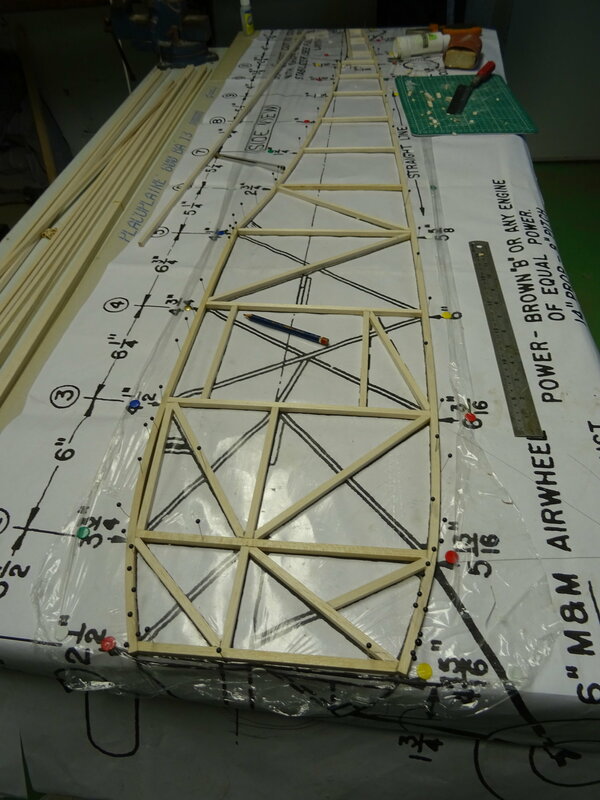 I felt like I did when I was 12 YO, built a then to me huge 33" wingspan Comet Sparky rubber powered. Although this is glow powered (original was ignition), kit is stick build like yours and with all print wood twice the size of Sparky. 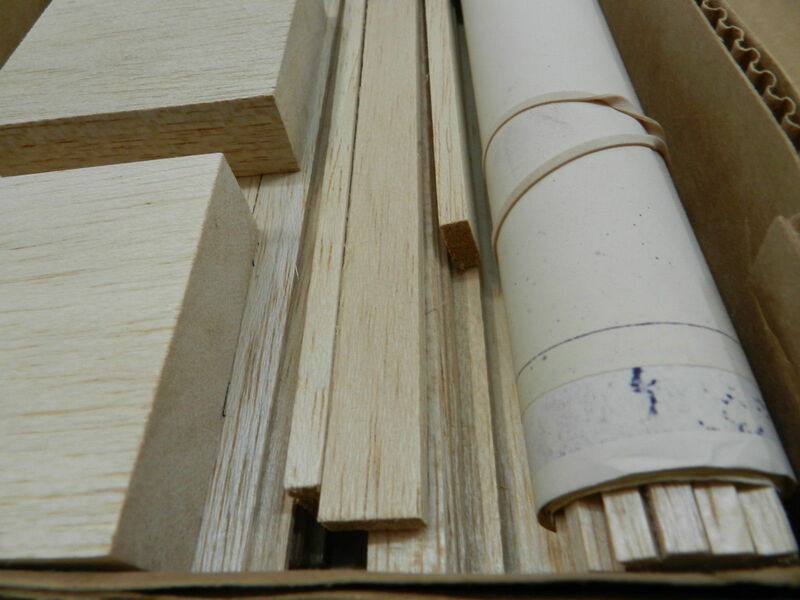 Printed wood that kit has been around. Not like the modern laser kits, but I'm good with a modelling knife. Do it the old fashion way of cutting out parts to make a "kit". Then glue, assemble, go from there. A.J. Freeflight Service was making kits, when? 1970's? Reminded me of that first Comet kit I bought back around 69 that I blame for my building addiction. Indoor Free Flight the gateway drug for R/C Addiction! this is what I got going. I once built a Tomboy. 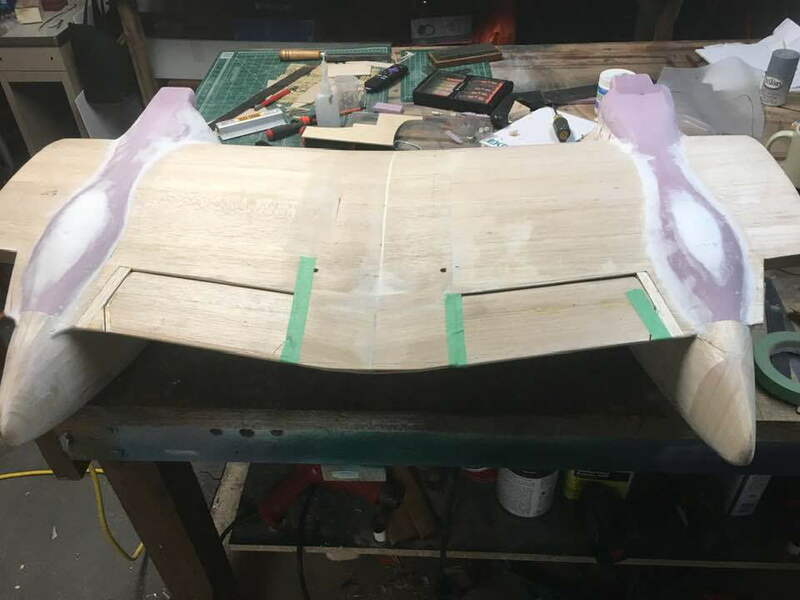 When the time came to remove the fuselage from the board, the fuselage distorted! 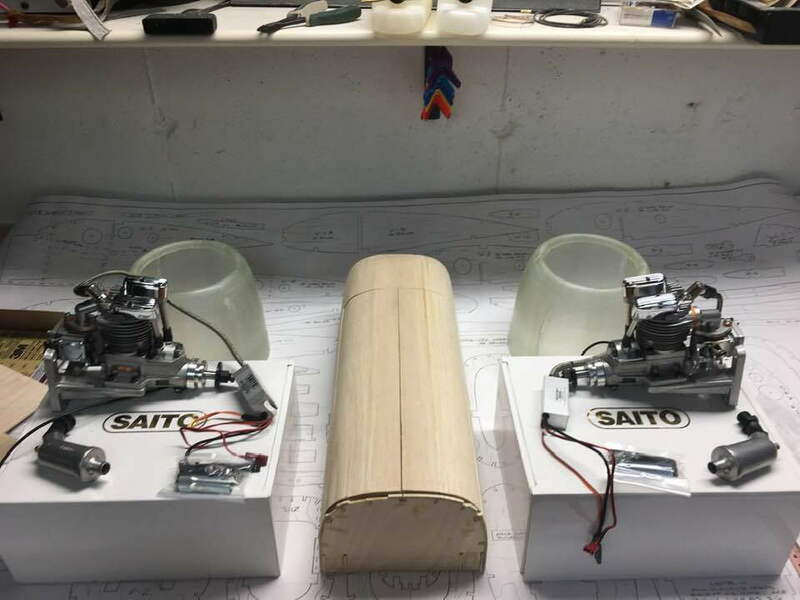 I probably hadn't fitted the sheeting between the first and second uprights which might have kept everything square but since then I have often used little triangles made up from 1/64" ply to reinforce the joint between the upright and the longeron. 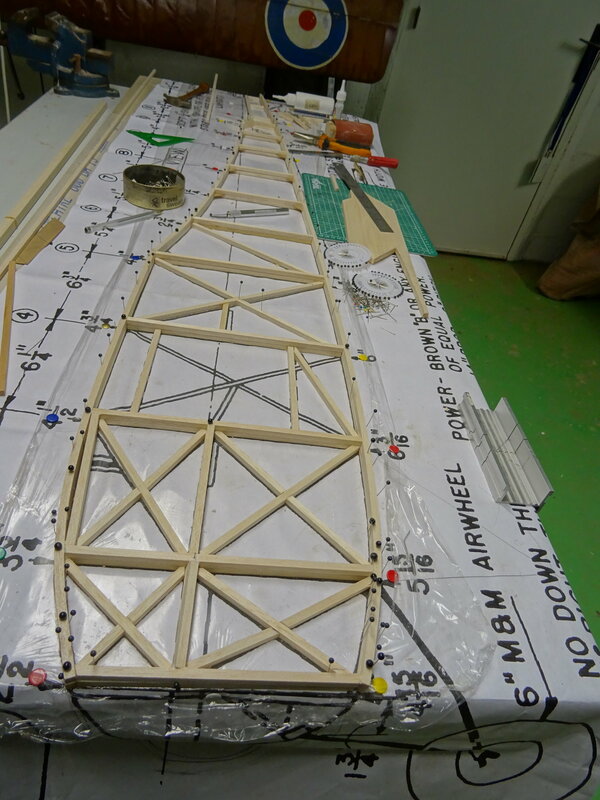 On the Big Guff there's so much diagonal strutting in the forward fuselage I doubt that anything would move out of shape but I've added the triangles anyway, to those joints which aren't supported by a diagonal! Feeling, probably incorrectly, that a balsa to balsa joint will be stronger than a balsa to plywood joint I've cut out little squares in the triangles so that the 1/4" sq horizontals will glue directly onto the longerons. The other pictures show the port side superimposed over the starboard side. As with the starboard side I got to the stage where it was necessary to fit the diagonals and stopped for tea! 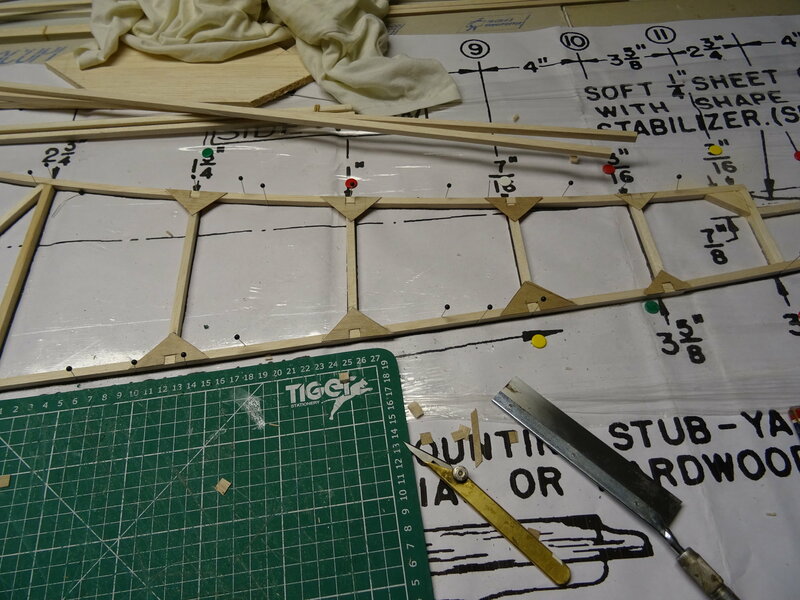 Eagle eyed observers will have noticed that I haven't completed the part of the fuselage which supports tail plane. This because there is a lad called Brice Letellier in our club, a retired legionaire, pictured below, who flies well but who has never built a model and would like to learn. I intend to show him how it's done later today, maybe even trust him with the balsa knife! Light fall of snow here this morning which is melting away. Well as they always say, 'better late than never', but so far you seem to be off to a very good start. 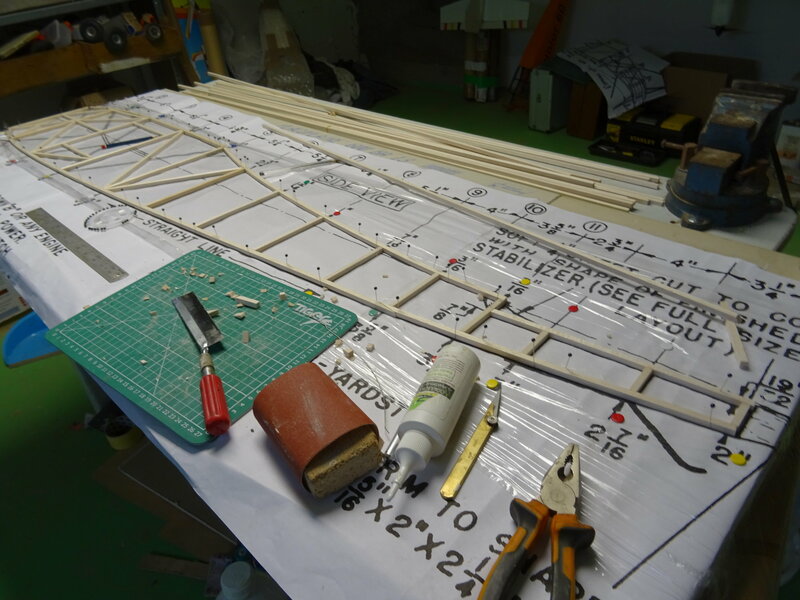 Theses days I seem to get a greater thrill and enjoyment from building rather than flying, so now I have three planes to maiden and I just bought myself a 1180 mm span electric J3 Cub kit, so in a short while if I am not careful it will be four to maiden. I too have 3 to maiden, two of them have as yet to run engines in them. Used, so I have no idea how they run. Hey Telemaster what type of material is your building service made off? I took a 6'x20" wide piece of 5/8" plywood from the big box store that I work at and attached a sheet of 5/8" sheet of gypsom board or what we call over here in the USA, sheet rock and attached it to the top of this board and it sets on top of my Roll Away tool chest. I didn't think at first if it would make a good building service but my local Hobby shop owner recommend it to try. It was hard at first to pin stuff down but it works great! 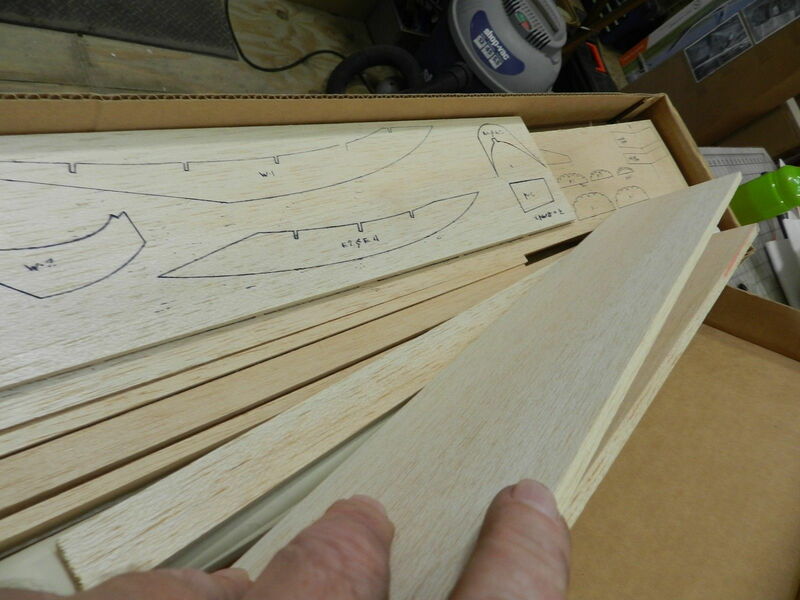 I have been building on a piece of wallboard for decades. The only problem I have found is CA will soak in if it gets the change leaving a hard spot. 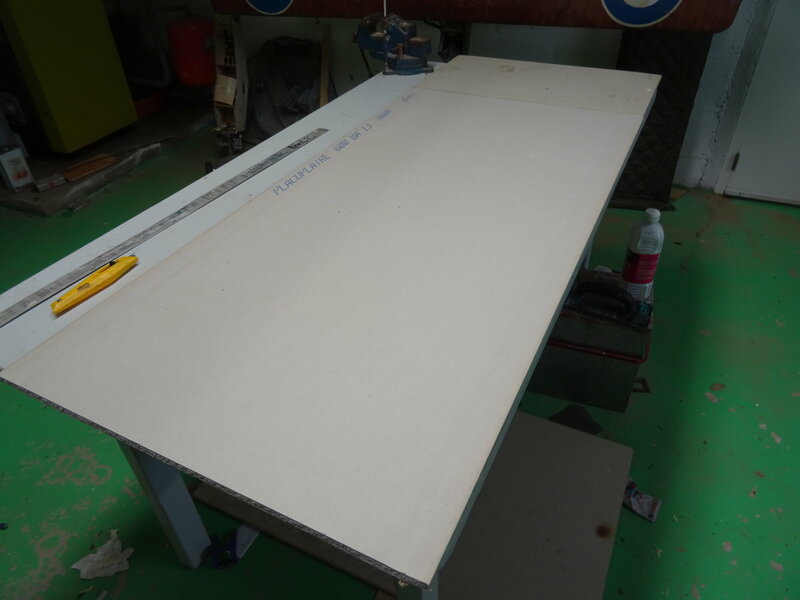 Gentlemen, for the Big Guff I am using a 1200mm x 600mm piece of plasterboard, plaque de platre in French, which is indeed made out of gypsum. That's about 4 ft x 2ft in Imperial measurements. Because of the length of the Big Guff's fuselage I've had to add a bit extra as the pictures show. Glue will mark the surfaces but I find that even a used board is flat enough for my standards! When they become totally unserviceable they are cheap enough to replace. For smaller models I have a piece of board, such as were used for school noticeboards, glued to a sheet of chipboard, as a building board. I suppose that all notices are posted electronically on computers, iphones and tablets at today's schools!